When I first heard about NLP, I brushed it off almost immediately as something that wasn’t for me. I met people who had completed NLP short courses and then believed they had this incredible new skill to better understand and communicate with others, but it wasn’t always the case. 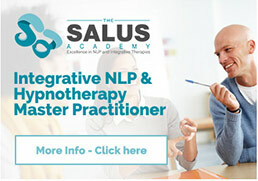 If I’m really honest, I started the course with the Salus Academy with the belief that I only wanted to develop my skills in Hypnotherapy. I felt that NLP was a tool I would have, but one I would rarely use. My preconceptions changed rapidly. Peggy utilises training techniques I had not experienced previously, and given my career in HR, this took me by surprise. Peggy is an expert in the therapies she teaches and uses her personal learning journey to develop her courses. She is a great believer in the value of practice to embed the skills we learn – this is not something that she merely talks about, as many trainers do, but Peggy has this woven through her teaching, so even as the skills become more complex and challenging to learn, the effort to practice doesn’t. I began the course with the aim of developing and deepening my professional skill set. But the course has had a much broader impact on me. As I developed my skills in NLP, I found myself demonstrating a greater level of empathy – my perspective broadened, I became more open to the ideas and suggestions people offered. I believe I’ve become a more thoughtful individual with a greater level of self-awareness, and I continue to experience the benefits of the course, both professionally and personally.